Before you set off to specify which countertops you want in your new kitchen or bathroom, make sure you know the basics about maintenance. Knowing your tolerance for upkeep may refocus your options. But, once maintenance is addressed, it’s time to find your inner artist. 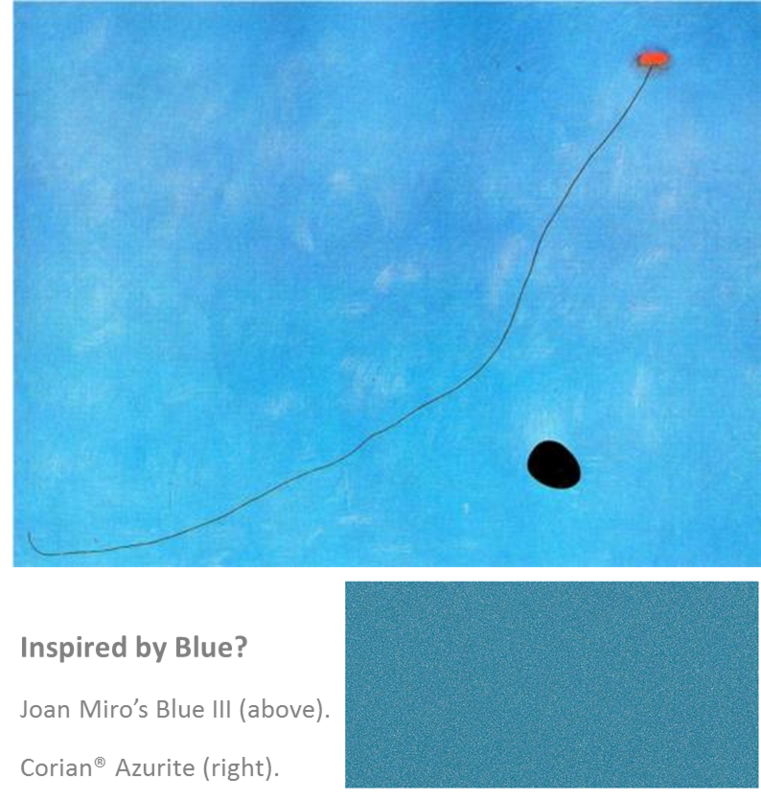 Here, we have selected the three surfaces we most commonly install along with slab samples inspired by some of our favorite artists. While it seems that everyone and his neighbor has granite countertops these days, there was a point in the not-so-distant past that granite was über-expensive and only came in a limited color palette (so limited, in fact, that you could count the colors on one hand and have fingers leftover). My how things have changed! 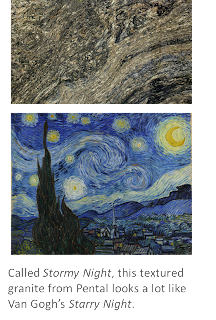 These days, you can find granite in a mind-blowing number of colors and patterns like the one shown here from Pental Granite & Marble. Generally durable and heat-resistant, when it comes to maintenance, granite does take some care. Because it’s porous, it requires sealing every one to three years – a process you really don’t want to overlook. Without sealing, the microscopic cracks and fissures inherent to natural stone can absorb stains and become home to bacteria that thrive in their haute new accommodations. Another consideration: make sure your cabinets are sturdy – granite is very heavy and needs extra support. Still, it’s easy to put up with a little bit of pain to live with such beauty! 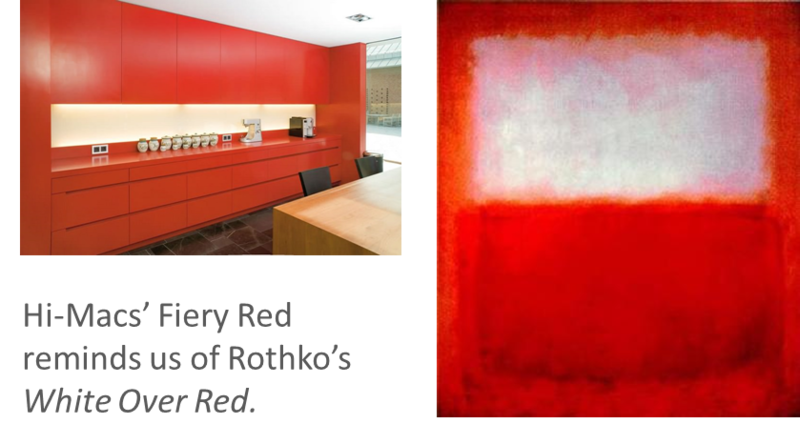 An engineered surface comprised primarily of acrylic, solid surface countertops – unlike granite – do not require sealing. Great at resisting microbial growth due to its lack of cracks and fissures, solid surface can be susceptible to heat and scratches (which can be buffed out) so take care with hot pots and sharp knives if you’re out for a virtually maintenance-free relationship. In the looks department, solid surface tends to be too uniform to pass for real stone (which, in some cases, is exactly the point). However, if you’re wanting colors not found within the real stone spectrum, like Fiery Red from Hi-Macs or DuPont’s Corian® Azurite, this is the ideal surface for you. Bold is beautiful! Also – and, perhaps, surprisingly – an engineered product, quartz countertops are formulated with ground quartz, pigments and resins, making them non-porous like solid surface (and a great choice to keep germs at bay). More durable than granite (less likely to crack and chip), quartz never needs to be sealed; this is what you want if you’re looking for a no-maintenance countertop. As with granite, the early days of quartz didn’t provide many choices but, thankfully, times are changing. 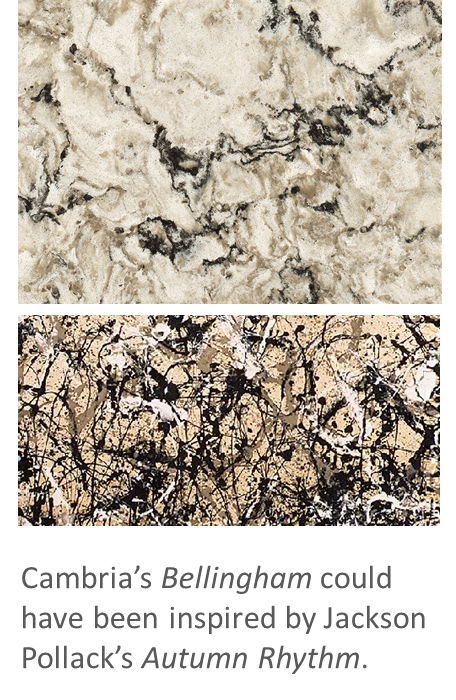 We find that Cambria offers a nice selection of colors and textures sure to please most tastes. In fact, we have Cambria’s Bellingham installed on our very own office beverage bar. When you’re ready to design your new kitchen, let us know. 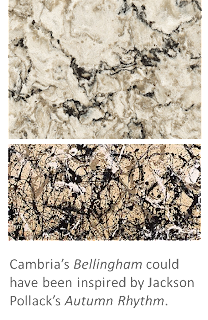 We’ll help you pick the countertop that reflects your personality and lifestyle.